Evaporites form on planetary surfaces when dissolved chemical solids precipitate out of saturated solution as their liquid solvent evaporates. Until recently theywere known to exist on only two planets: Earth and Mars. On Earth there are a variety of evaporite constituents including carbonates (CaCO3), sulfates (CaSO4), and halides (NaCl), progressing in order of increasing solubility. NASA’s rover Opportunity discovered evaporitic deposits on Mars that are primarily composed of sulfates — different from Earth’s due to a highly acidic formation environment. A third planetary instance of evaporite has now been discovered in an exotic location: Saturn’s moon Titan. Being so far from the Sun, Titan has a low surface temperature of 90°K (-183°C), just warmer than liquid nitrogen. Hence all of Titan’s water is permanently frozen. However methane on Titan plays the same role that water does on Earth and Mars. Titan has methane clouds, methane rain, methane rivers, and methane lakes and seas (Image of the Month, March 2010). Therefore the evaporites on Titan have an unusual nature relative to those on rocky planets. Instead of water being the solvent, on Titan the solvent is methane. And instead of salts being the solute, on Titan organic molecules derived from ultraviolet photolysis of methane dissolve in rain, surface, and ground liquid. Those organics precipitate out of lakes when the liquid methane solute evaporates, becoming evaporite. Image 1: Cassini VIMS/RADAR hybrid image of filled and dry lakes south of Titan’s methane sea Ligeia Mare. The brightness of the image is determined by synthetic aperture radar which indicates roughness, and the colors by Cassini’s Visual and Infrared Mapping Spectrometer indicate composition. 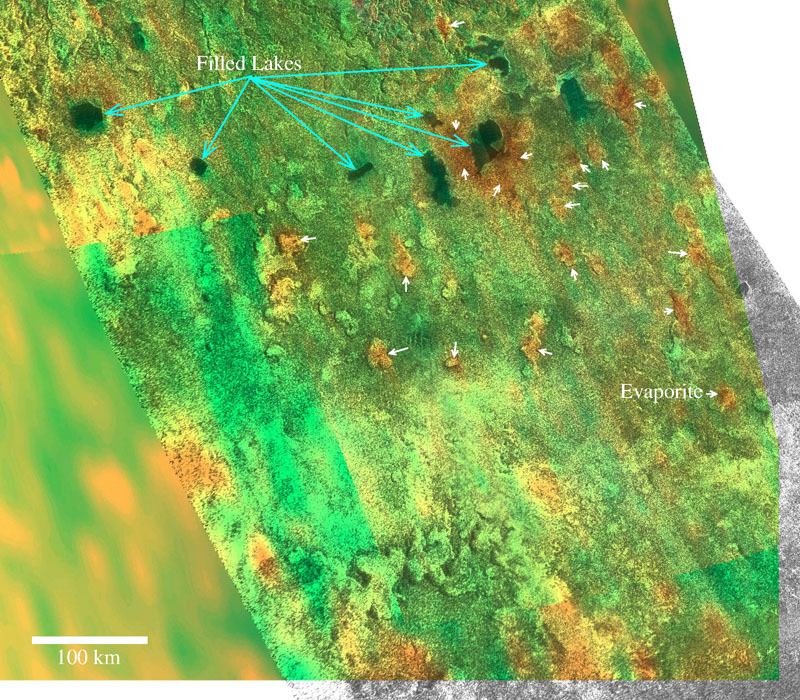 Some of the small lakes in the image are filled (cyan arrows). Other lakes show lacustrine morphology, but no evidence for liquids. Some of those dry lakes have the same composition as the surrounding terrain, but others show evaporites in bright orange.